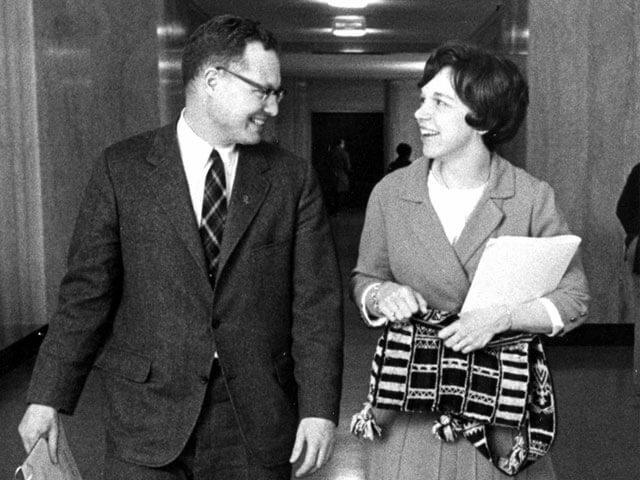 In the fall of 1968, Maradel Kummel Gale was elected to serve as Oregon Environmental Council’s first President at the organization’s second official meeting. As this personal narrative illustrates, her work in becoming an advocate for Oregon’s open beach legislation (“Beaches Forever“) helped spark involvement in forming what would become the first statewide multi-issue environmental advocacy group in Oregon, Oregon Environmental Council. Upon entering law school, she handed over leadership to fellow co-founder, Larry Williams. Gale is now retired and living in Washington. She is looking forward to attending our 50th Anniversary Celebration. Even though I was a city kid for most of my life, I grew up in contact with the outdoors. I was born in Bremerton, Washington, where my family lived at the end of Madrona Point, surrounded on three sides with part of the Puget Sound. Early movies of me show me on the pebble beach, putting the salty rocks in my mouth as fast as my mother could scoop them out of my eager hands. The smell of the salt water and the motion of the tides were embedded deep into my psyche. Even while living for two years in Cambridge, Massachusetts, before I was three, my parents explored all of the wonderful outdoor environments in the surrounding area – our family movies document the many hikes and picnics we took while living in New England. Returning to the West coast – to California – opened up a whole new chapter in my environmental education. My family was one of the very earliest to go camping. My mom would have the car packed, we would meet my dad at the train station when he returned from his daily commute into San Francisco, and we would drive from Burlingame to Sequoia National Park. There, on a Friday evening, we would pitch our heavy canvas umbrella tent in a nearly empty campground on a warm summer night. No reservations were needed, and there was no problem with crowding or nighttime disturbances. The few other families camping there were nestled into their campsites, enjoying the near-wilderness experience. 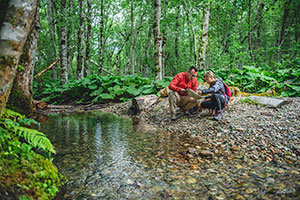 I learned so much on these trips: identification of the flora, about the fish in the streams, recognition of the stars in the deep night sky, how to protect the campsite so it was in better condition when we left than when we arrived, how to follow a trail through the woods. While I don’t ever recall hearing the term “environment,” my parents were deeply committed to an environmental ethic that they instilled in me and my sister. Our camping and outdoor adventures continued when we moved to the state of Washington, even though we lived in Seattle and had to travel to more remote places to camp. Camping was basically what we did in the summer, from Memorial Day (often in the rain) through Labor Day and sometimes beyond. Fast forward to my first official experience with an “environmental” organization, the U.S. Forest Service. My husband and I served as lookouts in 1962 and 1963 for the USFS on the Gifford Pinchot National Forest in SW Washington. We used to joke that we were probably the only two people at Washington State University (where we met) whose parents had taken us on the road between Trout Lake and Randle through the GP. At that time, in the 1950’s, this road was a one-lane dirt track, with the vegetation scraping along the sides of the car as our dads carefully drove along the rutted track. Having both had this experience as kids, we were delighted to end up in that same forest as lookouts. This was where I learned that what I saw from the roads was not all that was happening in the national forests of our country. Sitting high above the forest, the extensive clearcuts were shocking to see. My response was to form the Washington Anti-Clearcutting Association, with the motto: “Help Stamp Out Forest Ringworm.” The sign posted on the door of our frequently-visited lookout did not please our district ranger, but I kept it posted during the entire season and we were asked to return a second year to serve again as lookouts. An even greater shove toward active environmentalism came with our transplantation to Michigan where we were enrolled in graduate school. Having lived near and camped and worked in the National Forests of Washington and Oregon, we anticipated that those in Michigan (colored a lovely green on the official State of Michigan map) would be similarly worthy of our weekend visits. On Friday afternoons, we would load up the car with our camping gear and head out to the area that was designated as National Forest on our map. To our dismay, we soon learned (not soon enough – it took us at least five disappointing trips) that the National Forests in the Midwest were comprised of what was left after the trees had been cut and after the land that had recreational value, such as around lakes and along rivers and streams, had passed into private ownership. So while you could go and stand in a patch of woodlands, the only places to camp were small areas behind a pay-to-enter gate, and fenced off from the adjacent private lands. A far cry from the vast acreages of available pubic forest lands to camp in and explore that we had enjoyed in the Pacific Northwest. The Michigan version of “mountain” was also a gross disappointment to us – they barely qualified as hills in our minds. Maradel Gale talks with Senator Don Willner, The Oregonian, 1971. Fast forward again, to 1966, and our return to Oregon, where my husband had accepted a faculty position at the University of Oregon. By this time, in response to our discouragement at the scene in Michigan, we had joined the Sierra Club. We became active in the local chapter in Eugene, and I became the Lane County coordinator for a major campaign to save Oregon’s beaches for public access, “Beaches Forever.” Even though we fought a great battle to pass the initiative, the oil companies spent vast sums of money to defeat the measure on the November 1968 ballot. It was from that position and at that time that I was invited to the first meeting of people involved with the formation of the Oregon Environmental Council in November 1968. The first meeting of the group that would become the Oregon Environmental Council was held at the Chemeketa Clubhouse in Salem, Oregon. A seemingly random assortment of people involved in some aspect of working on environmental issues was invited. We met and talked and agreed to meet again. 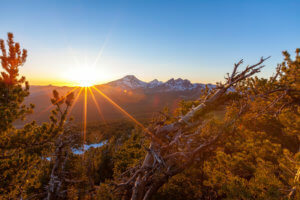 Similar organizations were in the formative stages in Washington State (Washington Environmental Council) and in Idaho. At the end of the initial meetings, I was selected to serve as the first President of the Oregon Environmental Council. Oregon’s next legislative session convened in January, 1969. Janet McLennan, with whom I had worked on the Beaches Forever campaign, kindly met me in Salem and took me through the state capitol, showing me the various offices, committee rooms, hearings rooms, the press area, where to get copies of the bills and many other important bits of information that would have taken me months to learn on my own. Soon I was commuting several times a week between Eugene and Salem to track a number of bills of concern to the new OEC. We had formed too close to the start of the session to have any bills introduced on our behalf, but there were a number of items of interest to us, mostly things that we didn’t want to see enacted. My first “victory” was to testify and lobby against a bill that would have allowed cities and counties to declare as surplus and sell lands that had been donated by individuals or estates to the local government as park lands. It was very exciting when I learned that the bill had been tabled by the committee and would not be given further consideration. The second legislative session in which I worked as a full-time volunteer lobbyist for the OEC was the 1971 session. This session became known as “the environmental session” due to the number of important bills that were passed relating to the protection of the environment. By this point, with a year between sessions to organize and develop potential legislation, and having developed contacts within the legislature sympathetic to our cause, we had a wide range of bills of importance to us. These included a bill to require a 5 cent deposit on beer and soda bottles and cans, a 2% dedicated fund for bike paths in conjunction with road construction, a billboard removal law, a measure to put the state in charge of the siting of nuclear energy plants (there were plans by utilities to build a number of these plants in the Willamette Valley and along the Oregon coast), a coastal preservation bill (this one morphed into the Coastal Conservation and Development Commission – a far cry from what we had sought), and more. By this session, I had studied and perfected the tricks employed by the savvy corporate lobbyists, and utilized them to benefit the environmental interests. No, this did not include wining and dining the legislators. Rather, it meant learning to work the legislators from most friendly to our cause to least friendly, always keeping the “friends” well-informed of what was going on with bills of concern to us, and hoping that those who were in the opposite camp would be less informed, and perhaps miss an important hearing or vote, or even be unaware of the importance of it. It also meant figuring out how to have the OEC’s proposed amendments to a bill become the document from which the committee members worked. In these pre-computer days, I spent endless evenings typing up proposed language and inserting it in the appropriate places via a cut-and-paste method incorporating the original printed bill. For those readers who have only worked with computers, that’s where the terms “cut” and “paste” came from. The bill in the 1971 session on which I worked the most intently, as there was no other environmental group working on this, was the bill to establish a role for the state in energy facility siting. One nuclear plant had already been sited along the Columbia River west of Portland. Another utility was planning a nuclear plant at a site on the central Oregon coast. All that was required was that the utility buy or otherwise acquire the land, and they could build their plant (this was in the days before the state required land use planning). The outcome was the creation of the Nuclear and Thermal Energy Council, which put the state in the driver’s seat with regard to facility siting. This constraint on the utilities, along with the growing recognition that nuclear power was not as inexpensive as had been anticipated, ultimately meant that no additional nuclear plants were built in Oregon. 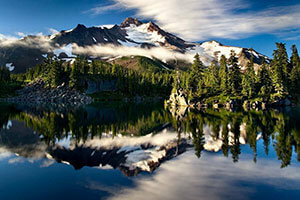 During this time, I continued to serve as President of Oregon Environmental Council. In the year between sessions, as well as during the 1971 session, I was busy traveling around the state speaking to groups about the OEC and the legislative process and our agenda there. I also wrote an environmental column for the Oregon Sportsman, a state-wide newspaper. And I had learned how to draft legislation which could be presented to friendly legislators for introduction in the session. The experience of writing so much legislation during the 1971 session, as well as debating regularly with corporate lobbyists, many of whom were lawyers, created in me an interest in going to law school. I applied to and was accepted by the University of Oregon in the class beginning in fall, 1971. At that time, there were only a handful of women – two in the 3rd year class, eleven in the class ahead of me, and 22 in my class. And only two of us in my class were “older” women (a status at which I laugh now from my current perspective – then I was all of 32). The other woman who was not directly out of undergraduate school had been as intensely involved in educational issues as I was in environmental ones. We both sported prematurely gray hair, and were referred to as “the education lady” and “the environment lady” by our classmates until they got to know us by name. Entering law school meant the end of my term as President of the OEC, and I turned over the organization to other capable hands. 2 Replies to "Maradel Gale"